All the information and photos in cactus art file are now available also in the new the Enciclopedia of Cacti. We hope you find this new site informative and useful. Eriosyce napina ssp. lembckei var. duripulpa. Field number RMF277 Punta Lobos, Chile. 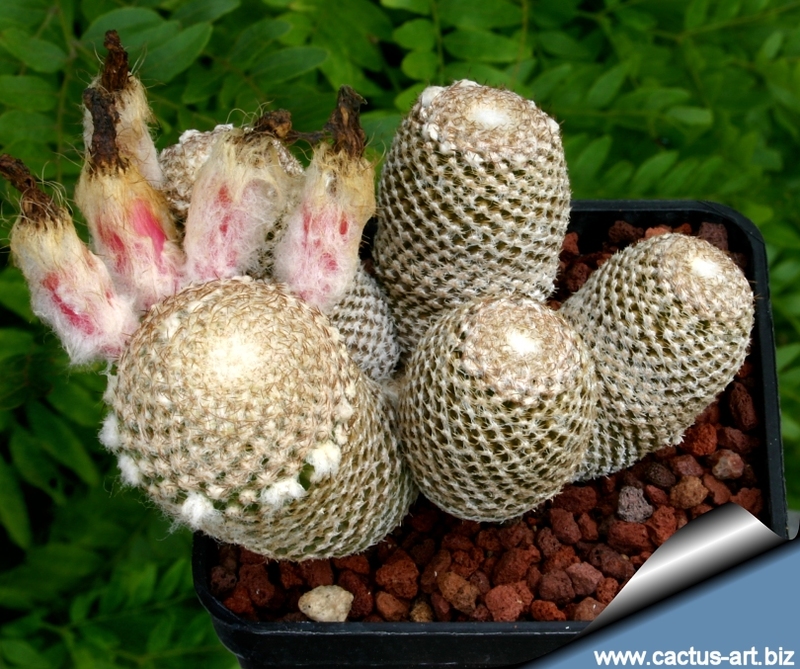 Description: Tiny offsetting species with a globose stem, slowly growing atop a thick, underground taproot, with a constriction between the stem and the root, eventually becoming somewhat elongated in cultivation. 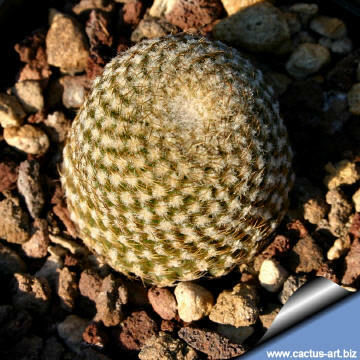 Spines: Short brown to black coloured radials of small size - 2 to 5 mm. Roots: Forms a tuberous root system with (usually) a very large carrot-like root of at least 7 cm in length. 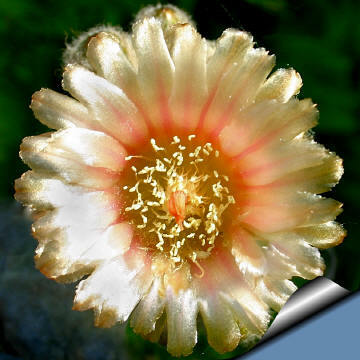 Flower: Pale yellow to pale reddish, with a silky shine, funnel-form; buds hairy with brown wool. Fruit: Large, red, clavate, wrapped in white wool. Phenology: Flowers already when young, synchronised flowering of the whole plants takes place over one or two days, and they remain open for about three or four days. Blossoming time: late spring. E. duripulpa is a tiny offsetting species with a globose stem, slowly growing atop a thick, underground taproot eventually becoming somewhat elongated in cultivation. Buds are covered by grey wool. Fruit is red with white wool. 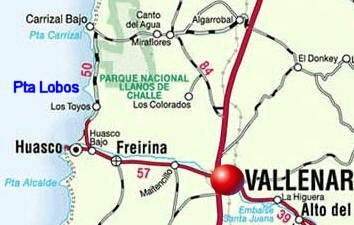 Distribution: Coastal Chile (Region III Atacama) Road from Vallenar to Huasco and nearest areas along the coast of the ocean . Habitat: Altitude: approx. 200-350 m.
Etymology: The genus name "Eriosyce" derives from the Greek words “Erion (εριον)” meaning “wool” and “Sykos” meaning “fig (a fruit)” . 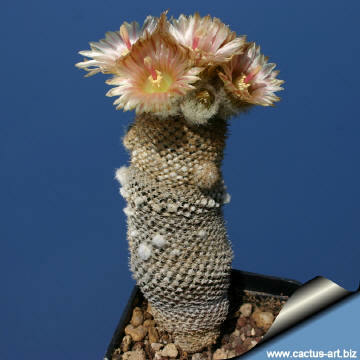 (The genus name implies: “woolly fruits”). The subspecies epithet "lembckey" was named in honour of "Hans Lembcke" Germany expert and author about Chilean species of cacti. 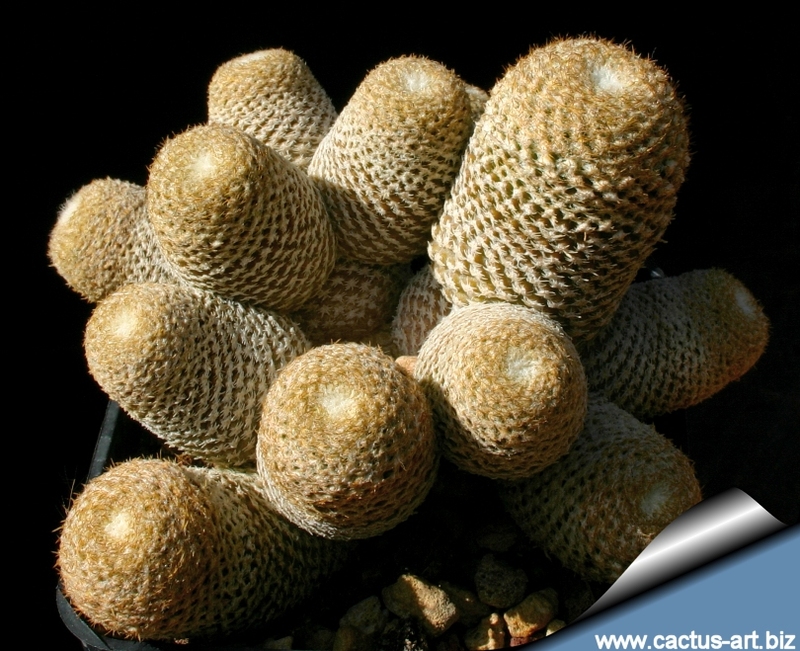 Cultivation: It needs a deep pot with very good drainage to accommodate its tap root. 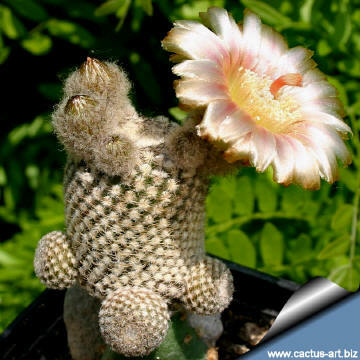 It is susceptible to over-watering. Sometimes it is grafted to avoid root rot problems. Keep dry in winter. Suited for airy exposures. 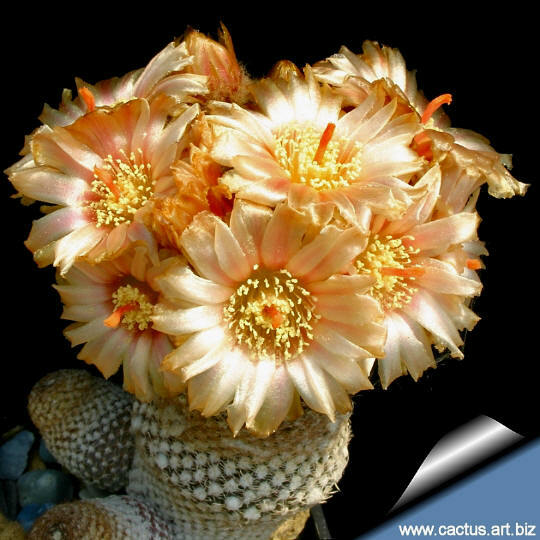 It likes full sun; and can tolerate light shade. 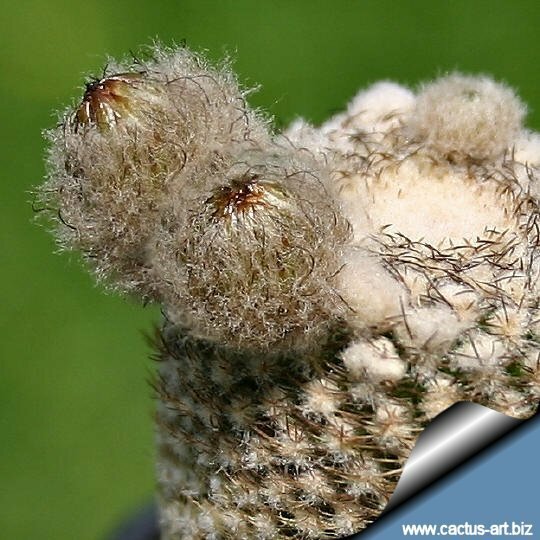 Pests & diseases: E. napina is especially prone to rot, therefore, underpot in a smaller container filled with very porous compost. Propagation: Seeds or graft. Seeds can be sown in the spring or summer. The seedlings should not be disturbed until they are well rooted, after which they can be planted separately in small pots.